Little Common Football Club’s penalty problem resurfaced during a 2-0 defeat at home to Saltdean United yesterday (Saturday). The Commoners missed a spot-kick for the fourth time this season as they remained third-from-bottom of the Southern Combination Football League Premier Division. All four of those misses have come at key times in games, the latest being while they were 1-0 down in the 35th minute against top five opposition. Instead of being level at 1-1, Common conceded a second shortly before half time and despite a spirited showing after the break, never really looked like clawing back their deficit. 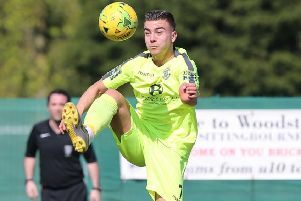 Already without unavailable pair Ryan Alexander and Sam Ellis, Common lost two more players when dual registered youngsters Panache Makwiramiti and James Pool were recalled by parent club Hastings United for their match away to Whitstable Town. Saltdean, with the stiff breeze at their backs, started the brighter and Ryan Warwick shot wide of the far post from an acute angle in the first 10 minutes. Common player-manager Russell Eldridge was then whiskers away with a 25-yard free kick. The visitors did find the net moments later. Luc Doherty received the ball on the Saltdean right and skipped past Common full-back Ollie Weeks before hitting a shot which took a slight but fairly significant deflection off Liam Ward on its way past Matt Cruttwell. Cruttwell made a smart save from a shot by Curtis Gayler, who had stepped inside two Common defenders, and that stage it looked like being a long afternoon for the Commoners. But they started to grow into the game around the midway point in the first half and their prospects began to look more encouraging. Common had a great chance to equalise when Wes Tate played a good ball through to Lewis Hole, who unselfishly squared to Jamie Crone, but his shot was saved by away goalkeeper Nathan Stroomberg. Tate flashed a powerful drive off target from just outside the box. Common were then awarded their penalty when Crone went down as he tussled with Saltdean defender Matt Hurley following Eldridge’s ball over the top, but Eldridge’s spot-kick was saved by Stroomberg low to his right. Common looked like they might be awarded another penalty a minute later, this time Crone going down under the challenge of Ash Jones, but the referee pulled play back for offside. Saltdean settled and Gayler’s whipped in free kick from the left was well tipped over by Cruttwell before Robin Deen volleyed wide from just inside the box. The visitors grabbed an important second goal in the 44th minute. Gayler’s cross from the right was met by a terrific glancing header from Will Berry into the far corner of the net. With the breeze now at their backs, Common tried to get on the front foot during the second period and most of the play took place in Saltdean territory, particularly in the first 15 minutes. But they didn’t look particularly threatening and Saltdean always seemed to have things under control, with Stroomberg not required to make a save of note after the turnaround. Crone struck an angled drive wide of the far post following a nice touch by Ryan Paul and flicked Eldridge’s low free kick from the right wide of the near post, while Eldridge blasted just off target from 30 yards right at the end. Saltdean’s best moment of the second half saw Harry Shooman drive wide from just outside the box at the end of a well-worked move down the left. Common: Cruttwell; Paul, Parsons, Eldridge, Weeks; Smith (Macdonald), Ward, Tate, Feakins; Crone, Hole. Subs not used: Ryan, Maynard. Southern Combination League Premier Division bottom six (played-points): 15 Langney Wanderers 27-21 (-28 goal difference), 16 Shoreham 27-21 (-31), 17 Arundel 26-19 (-38), 18 LITTLE COMMON 26-18 (-25), 19 Loxwood 26-18 (-29), 20 Eastbourne United AFC 26-15 (-44).